Meet at hotel lobby OR Sandakan Airport (preferably MH2042/AK6092). Transfer to jetty for boat ride to Selingan Island. The journey to island take approximately 45 minutes to 1 hour. On arrival, register at the Turtle Island Park’s HQ and check into chalet. After lunch at cafeteria, free at own leisure e.g, swimming or snorkeling. After dinner, waiting for the rangers call to observe turtle laying eggs. 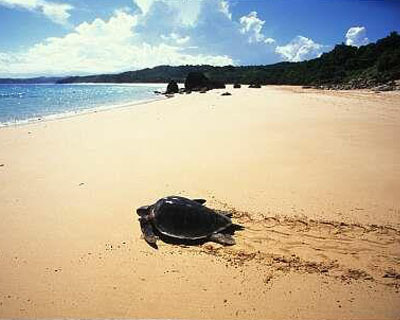 Transfer the eggs to the Hatchery and if there is any young turtle hatch lings, an opportunity to observe the release of the turtles to the sea. Overnight at chalet (Attach bathroom). Proceed to the free roaming area feeding platform. 1000 Hrs Feeding of Orang Utans. At this center, observe man’s closest relative “the Orang Utan” being rehabilitated to becoe wild in their natural habitat and experience a walk the Tropical Lowland Dipterocarp Forest of Borneo. Depart centre to The Rainforest Discovery Centre, walk to the stel canopy walk way, plants, orchids garden and many others. Depart to Sandakan Airport for flight MH2047 (ETD 1400).